I loved learning how to make date pinwheel cookies but I also love any cookies, cakes or pastries with dates in them. Dates just add so much flavor and moistness. Dates have been grown to eat and to make wine all the way back to the ancient Egyptians. Dates can be eaten and are very good plain; right from the hand either dried or soft. They can be stuffed with all kinds of great fillings like cream cheese and nuts or candied fruit. As you know dates are used to make many different recipes especially baked goods. My favorite bar cookies are the ones made with dates and I really love my sister taught me how to make her date pinwheel cookies. These date pinwheel cookies were one of my sister’s (Gloria) favorite cookies to make. Every year it was among her Christmas cookie recipes. When she was baking them, her kitchen was filled with a delightful fragrance. The cinnamon in the dough not only added to the aroma but added a “kick” to the flavor which many similar recipes do not have. 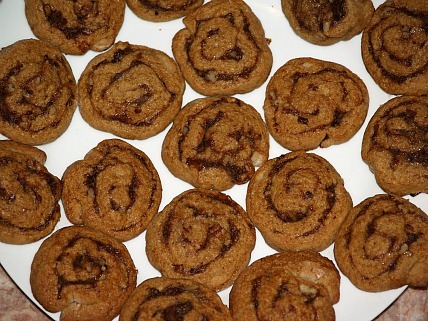 Of course, when I learned how to make these date pinwheel cookies, they had to go on my list of holiday recipes. I still ahve never been able to conquer that perfect pinwheel design with these. Maybe they are not supposed to look perfect! These date filled cookies turn out soft, moist and delicious. This refrigerated cookie recipe can be made ahead of time, rolled up in wax paper and sliced whenever you are ready to bake. Cook the dates in the water until soft. Add the nuts and cool. NOTE: May need a little more water to make spreading consistency. Mix all the ingredients together until well blended. Divide the dough into two balls. Roll each ball into a rectangular shape on a floured board. Spread with the date filling. Roll up beginning at the wide side like a jelly roll. Wrap tightly in wax paper and refrigerate at least overnight. Slice, place on cookie sheets and bake for 11 minutes at 350F degrees. Although I love the date pinwheel cookies, they are on my special Christmas cookies list. This date bar recipe is my favorite of all date recipes and I make these any time of the year. They are always delicious! Combine and cook over low heat until thickened; set aside to cool. Combine all crumb ingredients and mix well. Press half of mixture in a greased 9 X 13 inch baking pan. Spread cooled filling over top. (You may need to add a little more water to make it spreading consistency). Top date filling with remaining crumb mixture; press lightly with hands. Bake 30 minutes; cool and cut into bars. The date pinwheel cookies are not as rich as the date bars so you decide which you like best. This date bar recipe was given to me as from the Waioli Tea Room in Hawaii. It is a little different from the previous recipe; very rich and delicious. Combine crust ingredients and blend together; divide into 2 equal parts. For the date filling recipe, cook together dates, sugar, water and flour stirring over low heat until mushy. Put half crust mixture into a paper and greased lined 9 X 13 inch baking pan. Pour the date filling over the crust spreading evenly. Cover date filling with other half of crust mixture. Bake for 50 to 60 minutes or until set; cut into squares to serve. Like the date pinwheel cookies, many of the date cookie recipes are not as rich as a date bar recipe. They are equally as delicious just not as rich tasting. Combine filling ingredients and cook until thick; set aside to cool. Combine and blend together the dough ingredients; shape into ball. Roll dough out about 1/8 inch thick; cut with heart or round cookie cutters. 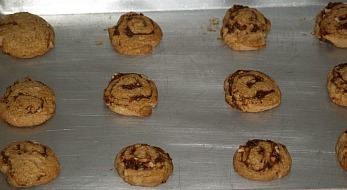 Place cookie on lightly greased cookie sheet; spoon a little date filling in center. Top date filling with another cut cookie; press around edges to seal. Bake about 8 minutes or until lightly browned. If you do not have time to assemble the date pinwheel cookies, here is an easy cookie recipe with dates. Preheat oven to 350F degrees; grease and flour bottom of loaf pan. Combine bread mix, egg and water; stir just until mix is moistened and pour into prepared pan. Bake for 45 to 55 minutes or until pick comes out clean. Cool for 15 minutes in pan; remove from pan and cool completely on rack. Trim crusts to make even edges; slice loaf horizontally into 2 layers. Cut each layer into 9 equal log shaped pieces (about 1 X 4 X 1 inches. Place logs on wax paper lined cookie sheet; freeze 30 minutes. Heat candy coating in saucepan over low heat until melted stirring constantly. Spread coating on top sides and ends of logs; return to freezer for 5 minutes to set up. Decorate tops with green and red designs for Christmas. This is another easy cookie recipe as an alternative to making the date pinwheel cookies. Allow cookie dough to soften at room temperature for 30 minutes. Combine dates, sugar and water in saucepan over medium heat stirring until mixture thickens. Remove from heat and stir in lemon juice; set aside. Roll out cookie dough between 2 sheets of wax paper to form a 10 X 12 inch rectangle. Remove top sheet of wax paper. Spread dough with date filling in a 4 inch wide strip down center of dough to 1 inch of ends. Fold shorter sides of dough1 inch over filling. 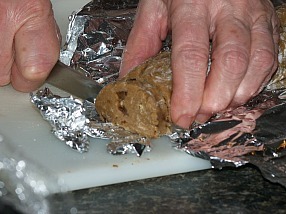 Bring long sides of dough rectangle over filling overlapping edges; pinch edges to seal. Invert on cookie sheet placing seal side down; remove wax paper. Bake for 25 to 35 minutes until light golden brown; cut into slices.